The FlexPulse™ is unique from other PEMF devices because it was developed based on more than 15 years of stem cell research, alongside decades of brainwave entrainment research. By increasing our body’s production of stem cells, the FlexPulse™ PEMF therapy device allows for true regeneration to take place, safely, naturally, and without side effects. Specially selected brainwave entrainment frequencies mimic the patterns of the brain to help you become alert or feel relaxed, based on your needs at the time. The FlexPulse™ employs a carefully designed sequence of magnetic pulses programmed to introduce a magnetic ﬁeld into tissues, primarily those experiencing pain or in need of healing assistance. The FlexPulse™ is designed to safely promote healing in muscle, tendon, ligament, skin, and bone tissues. These tissues make up more than 75% of the weight of the body.There are 6 programs in the FlexPulse™. Each contains a different frequency set based on research developed for different applications. Our understanding of what the body needs in terms of this stimulation is based on research (some garnered from the results of decades of magnetic ﬁeld research, some from clinical observations) and practical experience. From this research and experience, it is known that stimulation of nerves leads to muscle stimulation (and vice versa), which stimulates bone and therefore all the intermediately involved cells, too. Researchers have also made great strides in understanding the different communication patterns of the brain, and how the brain is susceptible to varying frequencies via brain wave entrainment and harmonics. Because of the wide variety of frequencies present in the FlexPulse™ system, it can be used for a whole host of different conditions, from relaxation, to nervous system balancing, to improving cognition, to helping to repair wounds. There is also a program containing 1,000Hz, which was shown in recent research to positively affect depression and anxiety. And because the FlexPulse™ reaches up to 200 gauss in intensity, it’s capable of reducing painful inflammation quickly and effectively. Each FlexPulse™ system has 2 major components – the pulse generator and the applicators. The unit is battery operated and compact – it can easily be placed in a pocket or strapped to an armband. The applicators emit the magnetic ﬁeld, and should be secured to the body where treatment is needed, including at any site of injury or pain. Because the system is battery-powered, it can be worn during activity or rest, and for any length of time desired allowing for many convenient treatment options. 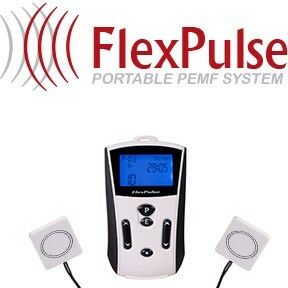 The FlexPulse™ PEMF device comes with 6 Programs that provide nutritious PEMFs between 3 Hz to 1000 Hz. Delivered worldwide with 30-days return period & 2 year warranty.